The twin Italian artists of Van Orton Design recently created an animated GIF of Link, Ganondorf, and Hyrule Castle. The piece is titled “The Legend of Zelda” and is a very unique and attention grabbing take on the rivalry between the Hero and the Prince of Darkness. The color scheme and rather geometric style make it reminiscent of Tron, and make it a worthwhile piece of artwork for any Zelda fan to view. Hit the jump to take a look! The darkness of the negative space really illuminates the neon-colored outlines of both the castle and of Ganondorf. The way the GIF is laid out makes Link appear to be lit by the glow of the objects surrounding him, making him the most realistic subject of the piece, as he is not outlined in sharp neon-sign-straight lines. 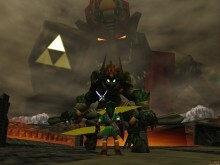 Ganondorf being the biggest and most defined subject stresses his desire for complete power, and really shows the against all odds nature of the battle between good and evil in Zelda games. The Van Orton twins have a large collection of GIF art pieces on their Tumblr, which you can see here. All of their pieces feature vibrant colors and gradients against, or encased in, dark solid colors. Colors or portions of each piece appear on the GIF at different times, which to me really makes the art come alive. Many of their pieces are suggestive of Tron due to their robotic retro 80s themes, and this piece in particular because of the struggle against a larger than life oppressive power. Prints of this piece can be purchased here for $40. This piece of artwork will be on display in Hero Complex Gallery’s “Gaming in the Gallery” exhibition in Los Angeles. The exhibition will run from December 5th-28th and feature multiple works of art from various artists, depicting popular scenes and characters from video games. To see these visit HCG’s website, here. What do you think of this piece of art? Does it do a good job of conveying the rivalry between Link and Ganondorf? Does it make you long for more Tron-esque Zelda art? Speak your mind in the comments!